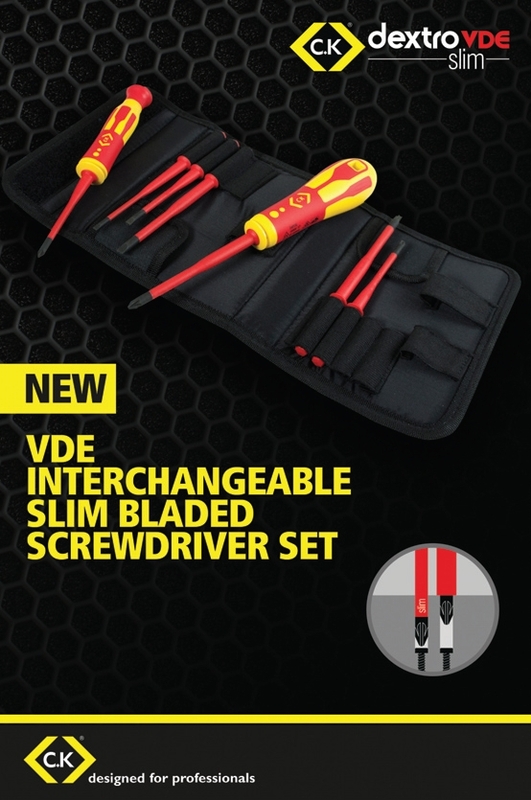 Following the success of its dextroVDE slim range of screwdrivers, C.K is set to enhance its popular Interchangeable Bladed Screwdriver, by giving it the same slimline treatment with the introduction of its new VDE Interchangeable Screwdriver Set. The innovative new 9-piece C.K VDE Interchangeable Screwdriver Set provides complete versatility for every electrician. The slim blades offer much better access to recessed screws and fixings and the set has the guaranteed safety that comes with a VDE approved product. The new C.K VDE Interchangeable Screwdriver Set also offers a lightweight and compact alternative to carrying a full set of screwdrivers, together with the assurance that each blade is individually tested to 10,000V for safe working up to 1,000V. 1000V VDE Screwdriver Blades in slotted, pozidrive and terminal modulo tip types. Other features include soft grip handles for increased comfort; quick lock mechanism for quick and easy blade interchange and toughened alloy steel blades for exceptional durability. This cost-effective VDE Interchangeable Screwdriver Set is sure to become a toolbox must-have among electricians and a sales generator for stockists.